This Sapphire Skull Engagement Ring Set is Made Of Solid 925 Sterling Silver and Solid 10k/14k/18k White Gold With White Rhodium Finish. This 2pc Matching Skull Anchor Couple Set is a Perfect Halloween Jewelry. * The Above Item Is Made Of Solid 925 Sterling Silver and Solid 10k/14k/18k White Gold With White Rhodium Finish. * All Fine Jewelry Items are Customized/Made on order only. * Stone settings in paves, prongs, bezels, channels or invisible may slightly differ as the stones on rings are set by a jeweler. * All metal and stone measurements and totals are approximated by production manufacturing computers and may differ slightly on 0.001 fraction levels. * The Above Women’s Skull Ring is Made With 4 Prong Set Round Cut 2.20ct Created Blue Sapphire at Center. 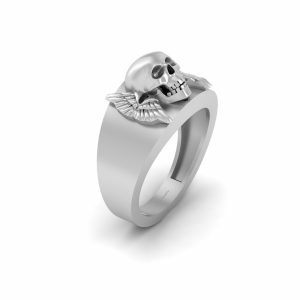 While Men’s Skull Anchor Band is Made With Bezel Set Sixteen Piece Round Cut Approx 0.08ct Created Blue Sapphire. * Angels are Believed to be Messengers From Heaven Who are Here To Love, Support, Comfort, Protect, Heal and Guide us. * Anchor Symbol – Security, Stability, and Being Grounded. * A Skull Represents Many Different Things at Once. At The Same Time That It Symbolizes Death, It Also Symbolizes The Power Of Life. * All Of Our Jewelry Items Are Nickel Safe. S925 Metal Stamp For Sterling Silver As Base Metal And Or 10k/14k/18k Metal Stamp For Gold As Base Metal. And Hence It Will Be The Perfect Gift For That Special Person In Your Life. * For International Clients- payment will be accepted only through PayPal. * We offer flexible payment plans for your convenience and can be tailored to suit your needs for price ranging from 300 to 3,000$. Payments are Non Refundable once production begins. I do not charge Interest or Fees for making payments under 4 months. Please contact me if you would like to work out a payment plan. * All jewelry product images are high resolution renderings generated by design and production computer;in 3D and are not real photographs, it’s visual perceptions may differ slightly from monitor type and resolution. * We Also Accept Customized Orders, Be It Our Or Your Designs; We Do Make It. ———Rhodium Finish Variations Like Rose Gold/White/Yellow/Gun-Metal. * We Can Make This Same/Any Jewelry Design On Custom Order Request Wherever Applicable With Natural (Diamonds,Gemstones) and Lab Created (Diamonds,Gemstones,Moissanite) As Well. * We Do Not Accept RETURNS For Items On SALE OR DISCOUNTS and For Any CUSTOMIZED ORDER/SIZE; We can offer REPLACEMENTS& EXCHANGES For A Genuine Reason. * No Other Or Personal Reasons Will Be Accepted For Order Return/Cancellation. * No Cancellation Will be Accepted After 24 Hours Of Purchase . * Do Keep Your Fine Jewelry Piece Away From Fire , Smoke, Water, Chemicals, Detergent, Etc Which Will Be Hard and Harsh For The Jewelry Piece And Always Clean It With a Soft Tissue Paper & Or Smooth Fabric/Handkerchief To Avoid Peeling Off Of The Rhodium/Electroplating Layer/Polish From The Jewelry Piece.